Thanks to USAF 100th Air Refueling Wing, the Romanian Air Force became certified to refuel from all U.S. KC-135s. A Romanian air force F-16 Flighting Falcon makes contact with a U.S. Air Force KC-135 Stratotanker for the first time. History was made when the U.S. Air Force and Romanian air force made their first air refueling contact Feb. 28, 2017, over Romania. With the help of the U.S. Air Force 100th Air Refueling Wing and one of their KC-135 Stratotankers, the RoAF became certified to refuel from all U.S. KC-135s, strengthening their partnerships and regional stability. 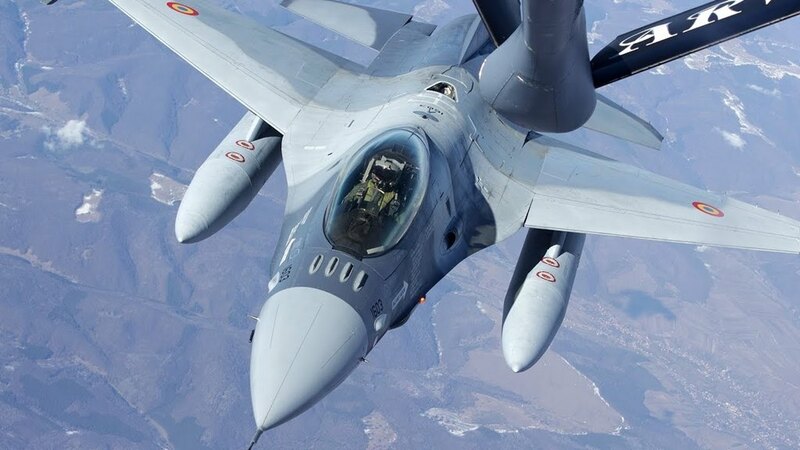 The RoAF initiated their F-16 program last year and in that short time, have refueled only from an Italian Airbus A330, but must obtain familiarization training and certification to receive fuel from a U.S. tanker and further their NATO integration. With U.S. air refueling abilities extending around the globe, the qualification and training increases interoperability between the two countries – especially in real-world situations. Both crews were excited to learn that they were very much on the same page when it came to AAR techniques and procedures. “This is someone else that’s on the team now,” Adkins concluded. “That can only be a good thing."